From Twitter and Facebook, to Pinterest and Instagram, social media engagement helps to build brands, boost sales and drive SEO. YouTube, a social platform, has become the second largest search engine, bigger than Bing, Yahoo, Ask and AOL combined, according to Social Media Today. Business leads generated via search engines have a 14.6% close rate, compared with 1.7% for direct mail and print advertising, according to Search Engine Journal. And companies that generate more than 1,000 Facebook likes also receive nearly 1,400 website visits each day, according to HubSpot. #1: More social media traffic equals more organic traffic. When it comes to Google’s search algorithm, there’s a correlation between an increase in the traffic your website receives from social median and the more organic traffic it then receives. Though, this may be a bit of an oversimplification, the connection between the two makes sense. For example, when your customers like, tweet, or share your latest blog post via social media, this interactivity signals to Google that your content is relevant and useful. Continued interaction via social media will help your site rank higher in Google search results. #2: Websites that make content easier to share rank higher. Understanding both the ways and reasons that people seek and share content is key to reaching new audiences. Highly shareable content builds relationships, credibility and trust, while also adding value. According to research conducted by the New York Times and Latitude Research, 94% of people who share social media content carefully consider how the information they share will be useful to their followers, and 68% of respondents share to give a better sense of who they are and what they care about. What does this mean for your business? Create content that aims to be thoughtful, interesting, insightful and useful. Create content that answers your customer’s questions. Highlight the problem your business solves for the customer, and show what makes you stand out from others. Take a position and add your own insights to industry news. And by all means, be sure to take advantage of plugins that make it easy for website visitors to quickly click and share your content. #3: Google authorship establishes authority and credibility. Google Authorship is a quick, easy way to boost online influence while driving clicks and conversions and establishing one’s online authority. “Author Rank” is the concept that an author can build brand recognition, trust and industry authority based on the content they publish online. The idea is that the more quality content you publish in a specific niche that is consistently shared through social media, the higher that content will rank. 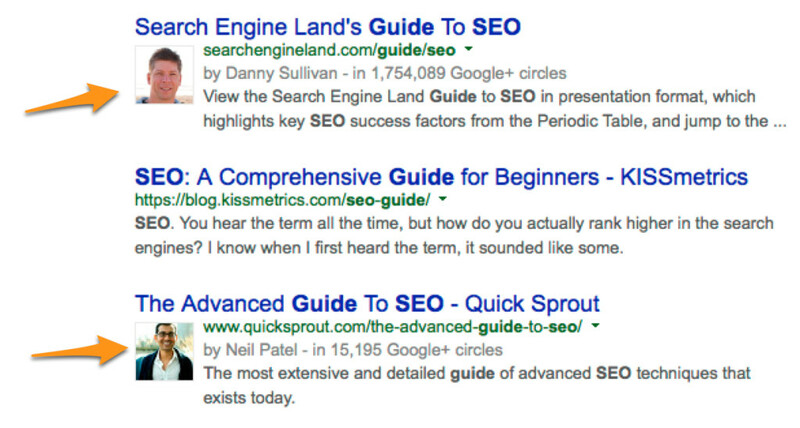 Authorship, as seen in search results, leads to more exposure as an expert in your industry.